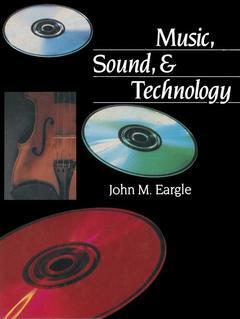 Music, sound, and technology (paper) Eargle John M.
Auteur : Eargle John M.
This book is about music. the instruments and players who produce it. and the technologies that support it. Although much modern music is produced by electronic means. its underlying basis is still traditional acoustical sound production. and that broad topic provides the basis for this book. There are many fine books available that treat musical acoustics largely from the physical point of view. The approach taken here is to present only the fundamentals of musical physics. while giving special emphasis to the relation between instrument and player and stressing the characteristics of instruments that are of special concern to engineers and technicians in­ volved in the fields of recording. sound reinforcement. and broadcasting. In order to understand musical instruments in their normal performance environments. the student must have a basic working knowledge of physical and architectural acoustics. The book begins with a review of the elements of acoustics. stressing the nature of sound fields and phenomena that are wavelength-dependent. The book then moves on to a discussion of those aspects of psychological acoustics that are of special concern to music technicians. most notably concepts of stereophonic imaging. loudness-related phenomena. and critical band theory. 1 Fundamental Mathematical and Physical Concepts in Acoustics.- 1.1 The basic quantities: length, mass, and time.- 1.2 Velocity and acceleration.- 1.3 Vectors.- 1.4 Force, energy, and power.- 1.5 A simple oscillating system.- 1.6 Wave propagation.- 1.7 Sound fields.- 1.8 Power, sound pressure, and the decibel.- 1.9 Directional characteristics of sound radiators.- 1.10 Environmental acoustical effects.- 1.11 Interference effects.- References.- 2 Psychological Acoustics.- 2.1 Physiology of the ear.- 2.2 Loudness phenomena.- 2.3 Localization phenomena.- 2.4 Pitch perception.- 2.5 Critical bands; consonance and dissonance.- References.- Additional Resources.- 3 Scales, Temperament, and Tuning.- 3.1 Major and minor scales.- 3.2 The harmonic series.- 3.3 The Pythagorean scale.- 3.4 The just scale.- 3.5 Meantone temperament.- 3.6 Equal temperament.- 3.7 Equal temperament in musical practice.- 3.8 Other tunings in contemporary performance.- 3.9 Pitch standards.- 3.10 The pitch spiral; key chroma.- References.- Additional Resources.- 4 Musical Sound Generation and Radiation.- 4.1 Basic power relationships.- 4.2 The chordophones—strings and sounding boards.- 4.3 Aerophones I—a simple open air column.- 4.4 Aerophones II—reeds and resonators.- 4.5 Aerophones III—the lip reeds.- 4.6 Membranophones.- 4.7 Idiophones.- 4.8 Starting and stopping transients.- 4.9 The voice.- References.- 5 Acoustics of String Instruments.- 5.1 The violin.- 5.2 The string family.- 5.3 The guitar.- 5.4 The harp.- 5.5 Modern versions of the bass and the guitar.- 5.6 Acoustical characteristics of string instruments.- References.- Additional Resources.- 6 Acoustics of Woodwind Instruments.- 6.1 Classification of woodwind instruments.- 6.2 Transposing instruments.- 6.3 The flute.- 6.4 The oboe.- 6.5 The clarinet.- 6.6 The bassoon.- 6.7 The saxophones.- 6.8 Acoustical characteristics of woodwind instruments.- References.- Additional Resources.- 7 Acoustics of Brass Instruments.- 7.1 Classification of brass instruments.- 7.2 Changing speaking length: crooks, valves, and slides.- 7.3 The horn.- 7.4 The trumpet.- 7.5 The trombone.- 7.6 The tuba.- 7.7 Acoustical characteristics of brass instruments.- References.- Additional Resources.- 8 Acoustics of Percussion Instruments.- 8.1 Classification of percussion instruments.- 8.2 Membranophones: the drum family.- 8.3 Metallophones.- 8.4 Xylophones.- 8.5 Ranges of the pitched metallophones and xylophones.- 8.6 Special effects.- 8.7 The drum set.- 8.8 Acoustical characteristics of percussion instruments.- References.- Additional Resources.- 9 Acoustics of Keyboard Instruments.- 9.1 Historical instruments.- 9.2 The piano.- 9.3 The celesta.- 9.4 The pipe organ.- 9.5 Electronic keyboard instruments.- 9.6 Acoustical characteristics of keyboard instruments.- References.- Additional Resources.- 10 Musical Ensembles.- 10.1 Evolution of chamber ensembles.- 10.2 Evolution of the orchestra.- 10.3 Acoustical power output of the orchestra.- 10.4 The vocal chorus with orchestra.- 10.5 Ensembles in the opera house.- 10.6 Ensembles in popular music.- 10.7 The musical theater.- 10.8 The symphonic band.- 10.9 Requirements for good ensemble and intonation.- 10.10 Sound pressure levels within ensembles.- 10.11 Spectra of ensembles.- References.- 11 Music and Speech in Performance Environments.- 11.1 Acoustics of enclosed spaces.- 11.2 Requirements for music performance spaces.- 11.3 Electronic concert halls.- 11.4 Halls for speech.- 11.5 Small halls for music performance.- 11.6 Acoustics of rehearsal spaces.- 11.7 Worship spaces.- 11.8 Acoustical isolation and noise control.- References.- Additional Resources.- 12 Principles of Speech and Music Reinforcement.- 12.1 Basic approaches.- 12.2 System stability and gain calculations.- 12.3 Intelligibility calculations.- 12.4 Systems for houses of worship.- 12.5 Systems for auditoriums.- 12.6 Systems for high-level music reinforcement.- 12.7 Systems for motion picture theaters.- References.- 13 Principles of Sound Recording.- 13.1 Basic system concepts.- 13.2 Microphones.- 13.3 Basic stereo pickup techniques.- 13.4 Magnetic recording.- 13.5 Signal processing.- 13.6 Recording system architecture.- References.- 14 High Fidelity Sound in the Home.- 14.1 Basic components of a high fidelity system.- 14.2 AM radio transmission and reception.- 14.3 FM radio transmission and reception.- 14.4 The long-playing (LP) record.- 14.5 The cassette.- 14.6 The compact disc (CD).- 14.7 Signal control.- 14.8 Amplifiers.- 14.9 Loudspeakers.- 14.10 Listening room considerations.- References.- 15 Overview of Music Synthesis.- 15.1 Anatomy of a musical sound.- 15.2 Attack: the initial transient.- 15.3 Steady-state conditions.- 15.4 Decay of tones.- 15.5 Ensemble considerations.- 15.6 Representation of steady-state waveforms in time and frequency domains.- 15.7 The performer’s interface.- References.- 16 Active Noise Control.- 16.1 Principle of active sound cancellation.- 16.2 Sound pressure reduction.- 16.3 Sound power absorption at room boundaries.- 16.4 Recent developments.- 16.5 Conclusions.- References.- Additional Resource.